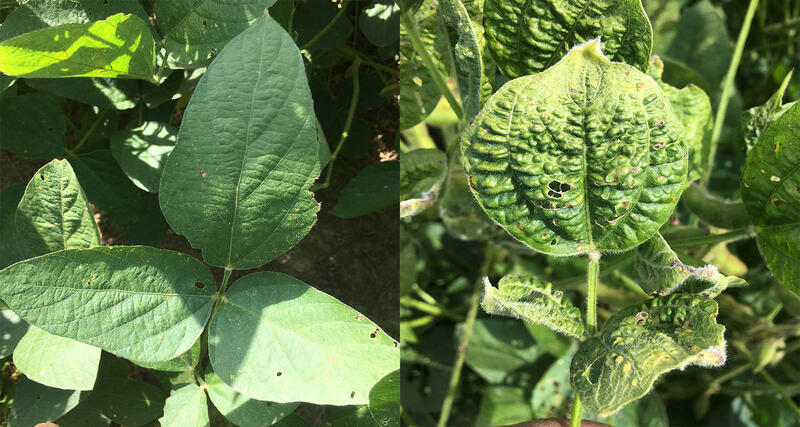 A healthy soybean plant in a field in Sikeston, Missouri, next to a dicamba-damaged soybean plant. The state Department of Agriculture has decided to partially ban dicamba use next June. The Missouri Department of Agriculture has extended its restrictions on dicamba herbicides to products manufactured by Monsanto and DuPont. The new rules are part of the state's effort to curb crop damage for farmers who don't use genetically modified soybeans. In the 2018 growing season, farmers in several counties in Missouri's bootheel region will not be allowed to spray Monsanto's XtendiMax and DuPont's FeXapan on dicamba-tolerant soybean and cotton after June 1. In the rest of the state, farmers cannot apply either product after July 15. Pesticide applicators can only spray XtendiMax and FeXapan between 7:30 a.m. and 5:30 p.m., submit daily forms to the department before every application and complete training with the University of Missouri Extension. The same rules were imposed on BASF's dicamba product Engenia in mid-November. Next June, growers in several counties located in Missouri's bootheel region will no longer be allowed to spray Engenia, BASF's dicamba-based pesticide. The Missouri Department of Agriculture announced Friday that it would ban the pesticide to protect farmers whose crops are vulnerable to damage from dicamba. The herbicide, intended to kill a notorious weed called pigweed, can be difficult to control. State regulators and growers associations are trying to support farmers who use the herbicide on dicamba- resistant crops while also protecting farmers who don't use dicamba-resistant seeds. Dicamba becomes a gas in hot weather and can drift for miles and damage sensitive crops. The chemical ruined approximately 325,000 acres of soybeans in Missouri during this year's growing season, according to plant scientists at the University of Missouri-Columbia. The state could extend the new regulations to other dicamba products, including Monsanto's XtendiMax and DuPont's FeXapan. Some farmers and agriculture experts think that the new label represents a start to addressing damage from dicamba while others, particularly pesticide companies, oppose the cut-off dates. "It's definitely a tightrope act, making sure we're delivering for our farmers and working side by side with industry and regulatory partners at the same time," said Gary Wheeler, CEO of the Missouri Soybean Association. "If a producer decides to use [dicamba-resistant seeds], it's his or her choice to use that product," Wheeler added. "And same goes for conventional [growers] to not use that product. So it's our job to make sure that those opportunities exist for both sides." There is no timeline for when the state could impose similar restrictions on XtendiMax. Monsanto's vice president of global strategy, Scott Partridge, said there's little scientific evidence to support the cut-off dates. "Pigweeds are going to grow throughout the season and we believe the science supports our growers having the choice throughout the season to use the newest and best technology," Partridge said. Partridge added that off-target movements of dicamba could be avoided if the University of Missouri Extension provides growers with more training on how to properly use the herbicide. Several factors, including wind, temperature and the formulation's volatility can play a role in moving dicamba off-target, but researchers and pesticide companies are debating which factor contributes more. Dicamba has been used since the 1960s, but has been applied mainly in the spring. Scientists are studying the chemical to understand how it affects crops in summer weather. Sikeston, Missouri — In front of several greenhouse scaffolds, Steve Hamra gestured to a metal cart containing trays of seedlings for bell peppers, tomatoes and romaine lettuce. About 150 miles south of St. Louis on a 10-acre site, Hamra is growing produce hydroponically, or in water instead of soil, for about 400 schools, in Missouri and other states. Updated March 31, 2017 – Stiffer penalties are now in place for anyone who misuses dicamba and other herbicides in Missouri. 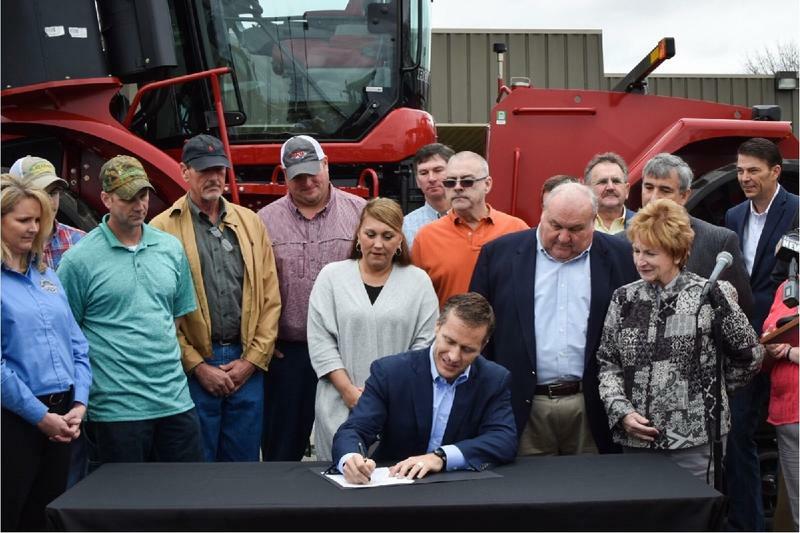 Governor Eric Greitens signed House Bill 662 into law Thursday, but also held an official signing ceremony Friday at the University of Missouri’s Fisher Delta Center in Portageville, which conducts agricultural research in the Bootheel region.